Harrington on Hold’em 1,2 and 3 are a series of books written by Dan Harrington and Bill Robertie. Dan Harrington is a professional poker player who has earned himself over $6.6 million and two WSOP bracelets one of which was the world championship bracelet that he won in 1995. Bill Robertie is the co-author of these books and is one of the best backgammon players in the world. Robertie has written many outstanding books on backgammon. Whether you’re looking for strategies on no limit hold’em multi table tournaments or sit & go’s the Harrington on Hold’em series of books is possibly the easiest to understand, straight forward and insightful set of poker books on the market. These books don’t need to be studied as hard as say The Theory of Poker because they’re that easy to comprehend. At PokerHarder UK we recommend this series of books to any poker player, experts and novice’s alike will be able to gain useful understanding of complex mathematical poker situations due to the expert way in which the authors have managed to break them down. 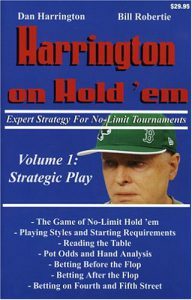 Harrington on Hold’em doesn’t just cover basic or conservative poker strategies it is able to able to address the merits of many different playing styles and it explores how to play against each type of opponent as well as helping you to choose a style that suits you. In summary, these books will not push you to play an exact style of play but instead will give you a multitude of different theories and ideas that have been proven so that you can choose which ones are right for you. The examples in the book also give a better understanding into how professional poker players like Harrington think in many different situations and poker hands. Dan Harrington’s books, Harrington on Hold’em are almost a must for all aspiring winning poker players.